At Trilogy Professional Group, we have divided our services into 3 levels to give our clients the flexibility to choose the level of service that best suits their needs. Ideal for small business clients wanting a basic service to ensure they are compliant with Australian legal, statutory and regulatory bodies. Ideal for clients wanting to monitor and grow their business, understand their financials and be able to make informed decisions based on them. This is for businesses wanting to measure performance on a regular basis and identify areas of improvement and opportunity. Ongoing education including workshops, seminars and monthly newsletters. 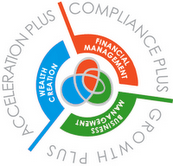 This is a monthly consulting service ideal for clients wanting to accelerate their business growth. Performance is measured, monitored and reviewed each month. A monthly action list is formulated to ensure improvements are achieved and opportunities can be taken advantage of as they arise. This is a customised service for businesses wanting more regular involvement from their Accountant and Advisor to fast-track their growth.